We’ve had many clients who come into our office as lawful permanent residents eligible to become a United States citizen. We tell them the same thing, every time. Run, do not walk, to apply to become a U.S.C. Why? Because as a lawful permanent resident, the Immigration and Nationality Act applies to you. As a United States citizen, it doesn’t. What does that mean in regular terms? A lawful permanent resident can be deported. A United States citizen can’t. A lawful permanent resident can be stripped of his or her green card. A United States citizen cannot be stripped of their citizenship, unless procured by fraud. A lawful permanent resident can be incarcerated for a long, long time if they are arrested on even minor crimes because ICE can launch a detainer on them preventing them from bonding out. A United States citizen doesn’t have to worry about that. A lawful permanent resident can abandon their green card by staying outside the country for too long. A United States citizen cannot abandon citizenship, unless intentional and deliberate on the part of the citizen. You may be thinking that none of these situations really applies to you as a lawful permanent resident. After all, you don’t commit crimes. You don’t leave the country for lengthy periods of time. What could happen? Unfortunately, many of our clients thought the same thing, only to later regret it. Nobody plans on getting arrested. Sometimes people are arrested, even though they are innocent. There are countless criminal statutes on the books and you may not even know you are committing a crime. For United States citizens, getting charged with some innocuous, minor offense may not be the end of the world. But for a lawful permanent resident, it just might. Minor criminal convictions can not only make you ineligible to naturalize for several years, it can be a basis for deportation, no matter how long you have been in the U.S. or how long you have had a green card. Even if you are 100% innocent of a charged offense, you may have to sit in jail for months without the option to bond out because ICE has placed an immigration hold on you. You may plead guilty to an offense that doesn’t make you deportable, but does make you inadmissible. What does this mean? It means that you will get a false sense of security when you plead guilty to a minor offense and are given court costs or probation and then leave the U.S. and are placed in deportation upon your return. 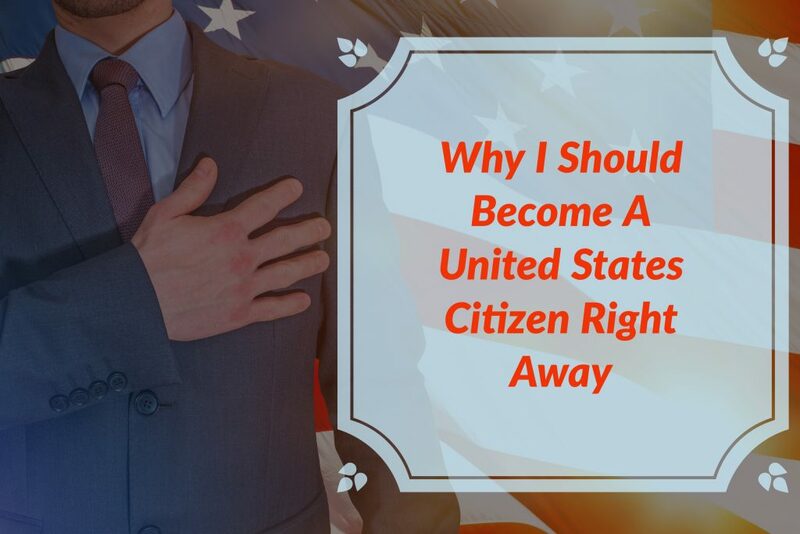 There is another reason you should become a U.S. citizen as quickly as possible. Immigration laws change. Immigration is administrative law. You don’t have the same rights in immigration law as you do if you were charged with a crime. The legislature can change the rules at any time. The president can change how the rules are enforced at any time. We are seeing a dramatic change in policy related to non-citizens. Lawful permanent residents are no exception. No matter how long you’ve been here or how long you’ve had a green card, the laws can change and the execution of laws can change. Non-U.S. citizens can be deported. Which ones and how continually change based on new laws and changing execution of laws. U.S. citizens cannot be deported. The point is – why wait? If you are planning on spending the rest of your life residing in the United States, why wait? In order to become a United States citizen, you must have been a lawful permanent resident for five years (or 3 years if based on marriage to a U.S. citizen and in some other circumstances), you must have “good moral character” during that time, you must have continuously resided in the U.S. during that time (5 or 3 years, whichever applies), and you must have been physically present in the U.S. for at least 1/2 that time (2 1/2 or 1/2 years, whichever applies). So, if you end up being charged with a crime, you may not be able to establish “good moral character.” If you have been outside the U.S. for extended periods of time, you may not be able to establish continuous residence or physical presence. By that time, it could be too late. So, if you are eligible now, you should apply now to solidify your place in the United States forever.